The state of the arts in Hong Kong are strong and flourishing, earning Hong Kong the high praise of being touted as Asia’s arts ‘promised land’ by Art +Auction Magazine in the March 2010 issue. The article entitled ‘Promised Land’ describes the active art market in the city, which has recently expanded financially and creatively. In 2009, when the global art market shrunk by more than a third to $43.5 billion, compared with $63.9 billion at its peak two years earlier, the Chinese art market bucked the trend. Sales in mainland China and Hong Kong reached a record high of $5.5 billion, up from $5 billion in 2008, boosting China’s share of the world art market that year to 14%, its highest share ever. Sotheby’s October 6th sale of 20th-Century Chinese Art was estimated to generate $10.4 million USD in sales, but instead produced an impressive $14 million USD. 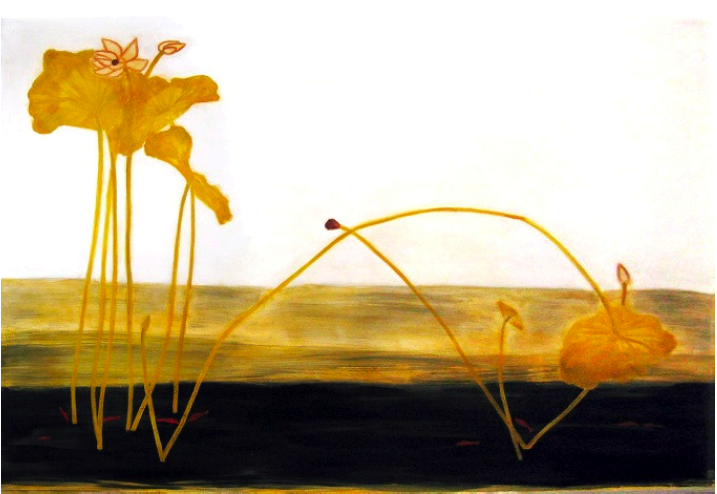 This successful sale included Sanyu’s Lotus et poissons rouges, 1955, which sold for $4.7 million, 31% higher than its greatest estimated price. This is the artist’s 2nd highest auction price to date, and solely accounted for a third of the show’s total revenue. The Modern and Contemporary Southeast Asian Paintings sale yielded $6.4 million, more than double its estimated yield and 76% more than the spring sale in this category. The sale’s standout work was Indonesian painter Lee Man Fong’s Magnificent Horses, 1966, which was estimated to sell for approximately $200,000–$320,000 USD, but raked in an artist-record of $1 million USD. Christie’s also experienced successful sales in November that produced $213 million USD over 5 days. A reported 47% of the buyers of contemporary Asian works were from mainland China, and favored pieces by more-established artists. 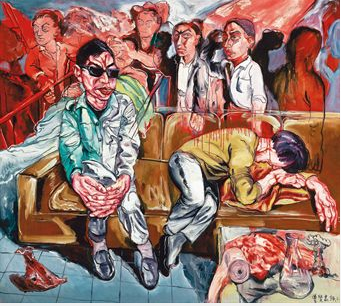 In the November 29th sale of Asian Contemporary Art and Chinese 20th-Century Art, Zeng Fanzhi’s Untitled (Hospital Series), 1994, surpassed its expected high of $1.5 million to attain $2.5 million. The November 30th Southeast Asian Modern and Contemporary sale featured Indonesian painter I Nyoman Masriadi’s Master Yoga, 2009, which also exceeded its high estimate of $130,000 to realize $467,102. Hong Kong has also earned the designation as Asia’s visual contemporary arts ‘promised land’ due to its vibrant and growing gallery scene, which features fine art not only from Asia, but the entire world. In addition, many of these socially responsible Hong Kong galleries have taken it as their mission to connect to and nurture the larger creative community. Hong Kong’s 10th annual ArtWalk, which was held on March 17th, included 62 participating galleries that opened their doors to the public for this charity event that supported Hong Kong’s Society for Community Organization (SoCo). Hanart TZ, founded in 1983 by the local critic and curator Johnson Chang Tsong-zung, has helped bring international exposure to mainland Chinese artists throughout the 1990s. This work has continued most recently with a solo exhibition of new paintings and mixed-media work by the young Fo Tan artist Lam Tung-pang (who is also represented in a concurrent group show at the Hong Kong Museum of Art through April 25). The Osage Gallery focuses on East and Southeast Asian art, while 10 Chancery Lane Gallery holds exhibitions of Vietnamese and Cambodian contemporary art. The Thai gallery Tang Contemporary Art — which has become significant here since opening a space on Hollywood Road in 2008 — offers an eclectic mix. The artists represented in its booth at last year’s Hong Kong art fair included the Thai-Indian Navin Rawanchaikul, the Beijing-based Yan Lei and longtime Paris resident Wang Du. There is also a growing local Hong Kong market for Western art, and numerous galleries have risen to meet this need. The London gallery Ben Brown Fine Arts opened a Hong Kong space last November showing works by leading Western artists Gerhard Richter, Thomas Ruff and Jeff Wall, alongside those of established Asian artists like the Japanese Yayoi Kusama and the Calcutta-born, Brooklyn-based Rina Banerjee. The Schoeni Art Gallery, which opened in 1993 with an exhibition of works by Chinese, Russian and Swiss artists, is boldly mixing things up, with the 2008 launch of Adapta, a collaboration with the U.K.-based Web magazine UKAdapta on projects involving urban and graffiti artists like Banksy. Additional galleries facilitating the introduction of Western art to Asia include: the Cat Street Gallery, Art Statements, and the Fabrik Gallery. Which artists from Asia are in the Pompidou Centre’s collection? Helpful sources of objective and rigorous judgement, museums provide an independent voice in an art world populated by more unscrupulous personalities and poor research than is ideal. But how can we find out what the top museums are acquiring and what they are holding in their storage rooms? Public institutions are often happy to share this information if you give them a call though of course this is not necessarily the case with private museums. Some institutions are now giving the public digital access to their entire collections and the Pompidou Centre is one of these. Its collection comprises over 61,000 works by more than 5,500 artist around the world making it the largest collection in Europe of modern and contemporary art. Chinese contemporary: Cai Guo-qiang, Kai Cui, Georgette Chen, Chen Zhen, Cui Xiuwen, Fang Lijun, Huang Yong Ping, Li Yongbin, Liu Wei, Wang Du, Wang Jian Wei, Wang Jin, Weng Fen, Yan Lei, Yan Peiming, Yang Fudong, Yang Jun, Yang Zhenzhong, Zhang Huan, Zhang Peili, Ming Zhu. In China today, contemporary art is readily available in public museums and private galleries in burgeoning gallery districts, and in three new art fairs in Beijing and Shanghai. Abroad, Chinese artists are the subject of museum retrospective exhibitions and grace the covers of international art magazines. Chinese contemporary art has come of age; yet there are few reference books for the reader who wants a quick but precise history of the field. This book aims to fill that gap. Short and to the point, it is arranged into seven sections outlining the rudiments of Chinese contemporary art: what you need to know about the artists, the art market, and what can legitimately be called a new art movement, perhaps the first great art movement of the 21st century. Buy this book on Amazon. Click here for recent posts on Chinese contemporary art, museum news, market watch, recommended research resources. This series of exhibitions, site commissions and educational projects entitled “Our Future” aims at opening its door to the future of art in China. The exhibition will give wide-angle view of the work and artistic practice of several generations of artists. Through special commissions and new acquisitions, work rarely seen before will be viewable to the public. Featuring around 60 Chinese artists, the exhibition will present no less than 92 works by such prominent names as Chen Zhen, Gu Wenda, Huang Yong Ping, Wang Guangyi, Wang Du, Zhang Xiaogang. New projects, performances and educational works from Cao Fei, He Yunchang, Qiu Zhijie and Yang Jiechang have been especially created for the Our Future exhibition. “Our Future: Site Commissions” is a long-term project and has commissioned installations, murals, paintings and sculptures especially designed for the exhibition site by artists such as Ai Wei Wei, Michael Lin, Wang Du, Wang Jianwei, Wen Fang, Yan Lei and Yan Peiming. Throughout the interior and exterior of the building, the organizer will pay tribute to the work these artists have accomplished over the past two decades in bringing Chinese contemporary art onto the international art scene by devoting its entire 8,000 square meters space to sustain their artistic creations, beyond the exhibition halls. If you are interested in this post, you might also be interested to read more about the UBS four decade survey of contemporary art on show in Beijing to November 7 2008.